Easily and efficiently deliver the miR-302/367 cluster for iPSC generation using the PB-Cuo-miR-302/367-IRES-GFP-EF1α-CymR-Puro Inducible Human iPSC Vector. This pre-built vector is ready-to-co-transfect with the Super PiggyBac Transposase Expression Vector (Cat.# PB210PA-1), and expresses miR-302a, miR-302b, miR-302c, miR-302d, and miR-306 with SBI’s cumate-inducible promoter. The vector also includes a co-expressed GFP reporter to simplify selection of transfectants, and the EF1α promoter co-expressing the cumate repressor (CymR) and puromycin resistance. Get robust, titratable gene expression with low background using SBI’s cumate-inducible vectors. These vectors take advantage of CymR, a repressor that binds to cumate operator sequences (CuO) with high affinity in the absence of cumate, a non-toxic small molecule. Providing much lower background expression than similar systems, SBI’s cumate-inducible vectors can provide up to 32-fold induction of gene expression. Figure 2. Robust, cumate-inducible expression of the miR-302/367 cluster. The PiggyBac miR-302/367 iPSC Vector (Cat.# PBQM-miR302) was co-transfected with the Super PiggyBac Transposase Expression Vector (Cat.# PB210PA-1) into 293T cells. 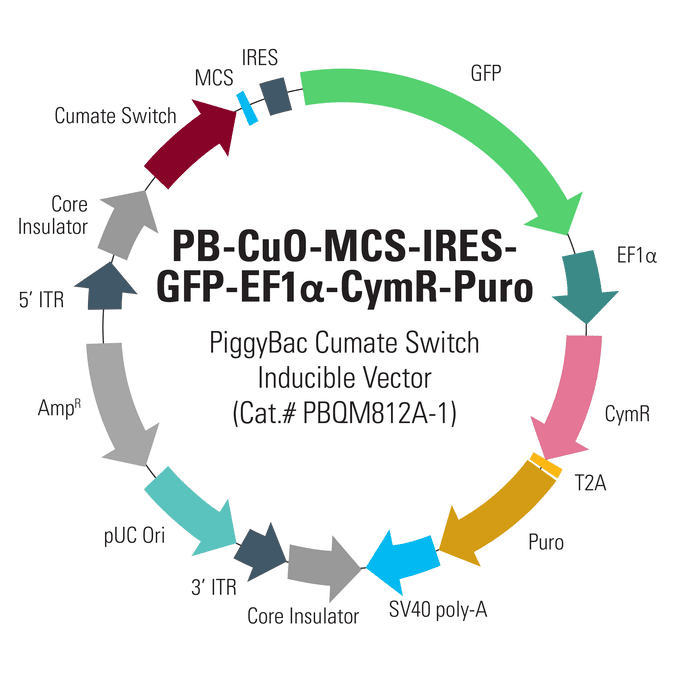 After three days growth to enable integration of the PiggyBac insert into the genome, induction was initiated by adding cumate to a final concentration of 30 µg/mL. Three days later, cells were harvested and expression levels of the miR-302/367 miRNAs measured using SBI’s qPCR-based QuantiMir Kit (Cat.# RA420A-1). miR-302/367 expression levels were normalized to the U6 control to determine the fold induction.